This is the fifth and final installment of the Essential Wound Care Series, which provides expert tips and techniques for managing both basic and specific wound types and challenges. Wound management can be exciting and rewarding, particularly when challenging wounds are involved. Success is best achieved through a wound management plan that provides the best patient care while meeting financial constraints of the client. In addition, veterinarians and owners need to be prepared for occasional setbacks and failures, approaching these situations with determination and a positive attitude. When a wound deteriorates or fails to heal, the easiest approach is to consider it a new wound and reformulate a plan based on the current status of site and patient. Many clinicians develop a wound management plan based on wound classification (ie, clean, clean-contaminated, contaminated, dirty). Clean wounds are aseptic surgical incisions that have not entered the respiratory, digestive, or urogenital tract. Entry into one of these areas during surgery results in a clean-contaminated wound, assuming contamination is minor. Figure 1 above. An infected surgical site is classified as a dirty wound. Dirty wounds should be cultured, debrided, flushed, and managed open until debris and necrotic tissue are no longer present and infection is under control. This may necessitate exposure or even removal of orthopedic implants. Clean and clean-contaminated wounds are usually managed with primary closure, while contaminated and dirty wounds require more intensive treatment. Regardless of wound type, management follows the same basic steps: clipping and preparing the skin surrounding the wound, cleansing the wound of any debris or superficial contaminants, obtaining a deep tissue culture for biopsy as needed, debriding any necrotic or infected tissue, and providing wound coverage, whether by primary skin closure (clean/clean-contaminated wounds) or by bandaging. Wounds are usually flushed with sterile saline or a diluted (0.05%) chlorhexidine solution (see Making 0.05% Chlorhexidine Solution). The addition of 25 mL of 2% chlorhexidine solution to a 1-L bag of sterile saline will produce a solution of just under 0.05%. To dislodge bacteria from the tissue surface, a lavage pressure of 8 psi or greater is recommended. To produce this pressure, the lavage fluid can be delivered using a 35- or 60-mL syringe and an 18-gauge needle. For large-volume flushes, a bag of flushing solution can be attached to one ingress port of a 3-way stopcock, the syringe to the second ingress port, and the 18-gauge needle to the egress port (Figure 2). With this setup, the syringe can be filled multiple times without unhooking it. Figure 2. This 4-year-old dalmatian suffered extensive burns during a house fire. Lavage was accomplished by attaching an 18-gauge needle, syringe, and bag of 0.05% chlorhexidine solution to a 3-way stopcock. Wounds heal best when their surfaces are slightly moist; however, the skin surrounding the wound should be kept dry to prevent maceration. For open wound management, the frequency of bandage changes depends on characteristics of the wound and effects of the dressing. Topical dressings (eg, sugar) may encourage greater effusion, necessitating q12–24h bandage changes, while silver-impregnated foam pads (Algidex AG pad, deroyal.com) or other absorptive dressings may be left for several days. Infected wounds often require daily bandage changes, while maturing wounds may only require weekly evaluation. The decision must be made to either let the wound heal by second intention or perform delayed primary closure. The wound is considered ready to close when no infection is present, tension-free closure is possible, and the wound has a healthy bed of granulation tissue. Presence of new epithelium around the wound edge (Figure 3) is a good indication that the wound is healing appropriately and delayed closure can be attempted. Figure 3. This 7-month-old Labrador retriever developed a Clostridium spp abscess over the dorsal interscapular region after SC buprenorphine administration. The site was managed initially with honey bandages and subsequent VAC therapy. Presence of new epithelium surrounding most wound margins is a good indication that the wound is ready to close. Necrotic tissue near the center of the wound and along one margin was resected before the site was covered with an advancement flap. In this final article of The Essential Wound Care Series, two cases of wound management are presented. 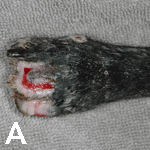 In the first case, the dog did not respond to open wound management and topical antimicrobials but improved dramatically after vacuum-assisted closure (VAC) therapy. In the second case, the dog did not heal after VAC therapy, and further treatment was limited by owner financial constraints. Healing was achieved with minimal management after implementation of a novel wound-packing technique. An 8-year-old mixed-breed dog with a 1-month history of paraplegia chewed on her foot, traumatically amputating two digits and damaging a third. The wound continued to deteriorate despite open wound management with topical antimicrobial dressings and bandages. Step 1. After a wide clip and surgical preparation of the surrounding area, the wound was lavaged with 0.05% chlorhexidine solution and a tissue sample was then obtained for culture. Obtaining a tissue sample after lavage provides a more accurate culture result, as the sample will then be free of environmental contaminants. The culture grew methicillin-resistant Staphylococcus pseudintermedius, and treatment with oral chloramphenicol was initiated. Step 2. With the patient under anesthesia, necrotic tissue was removed via sharp debridement, including amputation of the exposed phalanges. 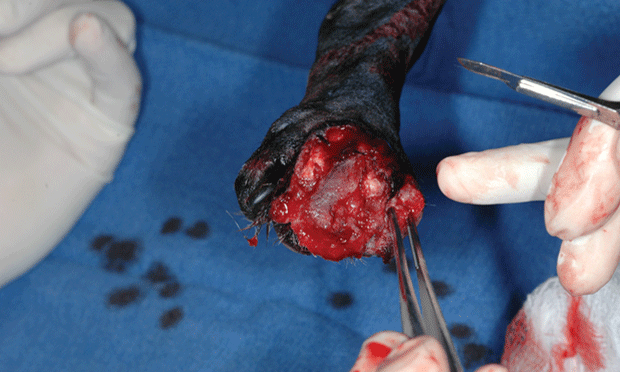 The dog also had an abscess that extended below the entire surface of the metatarsal pad. Author Insight: Soft spots or wounds should be probed with a sterile instrument to determine the extent of tissue disruption and to locate any pockets that require drainage. Author Insight: Although bacteria may appear sensitive to marbofloxacin on culture plates, many methicillin-resistant staphylococcal infections quickly become resistant to fluoroquinolones. Chloramphenicol is often effective in these patients. 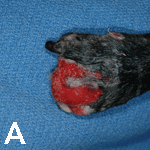 Owners should be warned to wear gloves when administering the drug to avoid rare, idiosyncratic, aplastic anemia. Step 3. To maintain as much tissue as possible, debridement was limited. VAC therapy was initiated to provide rapid removal of debris and purulent material, reduce swelling, and encourage granulation tissue formation. When used on the foot, padding should be placed under or around the nails to prevent trauma to adjacent tissue. Step 4. The bandage was changed q24–48h during VAC therapy. After 6 days (A and B), the wound had a healthy bed of granulation tissue, and a small strip of skin reattached itself to the dorsal surface of the bed. The abscess pocket in the pad had contracted, and no purulent material was evident. The wounds were bandaged with wound dressing (Algidex AG pad), cast padding, and nonadhesive wrap. Step 5. (A and B) Four days after placement of the Algidex AG bandage, the wounds were nearly healed. Bandages were changed after 4 days and q1wk thereafter, unless damp or soiled. Step 6. (A and B) The wounds healed 4 weeks after initial surgical debridement. Protective bandages and boots were required because of continued ataxia, abnormal pain sensation, and proprioceptive defects. A 9-year-old schnauzer underwent radical resection of a necrotic mass that included the hip fat; flank fold; and vastus lateralis, external abdominal oblique, and internal abdominal oblique muscles. Ten days after surgery the dog developed a draining tract along the incision. Step 1. Deep tissue culture produced 20 colonies of Staphylococcus schleiferi subsp coagulans, which was sensitive to clindamycin. 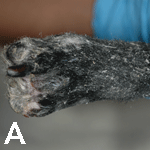 Initial treatment included VAC therapy and subsequent primary closure over a drain; however, the area dehisced, and the wound persisted despite appropriate antibiotic therapy, exercise restriction, and use of an Elizabethan collar. Author Insight: Motion, self-trauma, tension, excessive dead space, infection, and systemic illness can hamper the body’s efforts to heal. These factors should be evaluated when healing is delayed. Step 2. Because of financial constraints, the owners declined further workup and intensive treatment. The wound pocket was then filled with a borate glass nanofiber packing (RediHeal) and covered with a bandage. Step 3. Seven days after placement of the packing, the wound was significantly smaller and a deep pocket was no longer present. The packing was replaced, but the wound was left uncovered. Author Insight: Nanofibers are currently being evaluated for healing of chronic diabetic ulcers in humans. Some forms of nanofibers can be used for delivery of tissue factors, while others can be used to fill gaps in bone. Step 4. The wound healed 17 days after placement of the glass packing. ‘Cotton candy’ that heals? Borate glass nanofibers look promising. Wray P. Am Ceramic Soc Bull 90:25-29, 2011. Dressings, bandages, and splints for wound management in dogs and cats. Campbell BG. Vet Clin North Am Small Anim Pract 36:759-791, 2006. 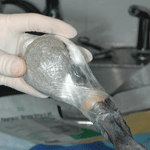 Effects of negative pressure wound therapy on healing of open wounds in dogs. Demaria M, Stanley BJ, Hauptman JG, et al. Vet Surg 40:658-669, 2011.